In honor of Star Wars Day 2017, Mondo released two brand new Star Wars Portrait Prints by Mike Mitchell last weekend – Darth Vader, based on his original appearance in Episode IV: A New Hope and an Imperial Stormtrooper. Hopefully all the diehard Star Wars fans out there were able to reserve their very own copies of these two iconic villains at some point over the weekend. “Darth Vader” and “Stormtrooper” by Mike Mitchell are 12”x16” hand signed and numbered Star Wars giclee portrait prints and retailed for $60 each. 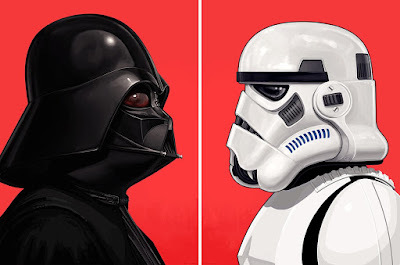 Produced in partnership with Acme Archives, these two Star Wars Portrait Prints were sold as timed-editions, with the final print run for each design set by the number of orders placed in a 72 hour period, which ended yesterday.